again way of redeeming sinners. (‘There is one who is all-powerful. That one is God. May you find him now.’) Both of them are now not so sure; what they cling to is a belief that whatever it is you’re after you can’t do it on your own, and you’re better off in a ‘meeting’. This is a different object from what the rest of us understand by a meeting, where lots of us gather in SOAS or the Conway Hall and listen to Lindsay German and nine other people denouncing the Tory Government’s policies somewhere (with twenty minutes for questions if we’re lucky) – it’s a more intense and more interactive affair. In the case of AA, as many meetings as possible, say ninety in ninety days. Which is difficult if you’re an alcoholic in Latvia (say – a not unlikely situation); in the case of the Quakers, once a week will probably do. You go to the meeting, stay for an hour, have tea or coffee, wash up and (hopefully) feel better. The impartial observer notes that the main difference – why do I even bother to say it? – is that Quakers say almost nothing all the time and just believe that the Spirit is giving them a helpful push along the road, while alcoholics talk compulsively about themselves – about their previous appalling behaviour, their recent lapses, their failure to progress from Step 6 to Step 7. Some alcoholics think that the Spirit or Higher Power is going to help them, others are (like some Quakers) quite frankly atheists. In any case, they feel/hope that this going-to-meetings activity is the essential element in getting anywhere. I owe a great deal to these odd and slightly irrational practices. Many Quakers these days make a great deal of the fact that they have NO CREED AT ALL; while the alcoholics have Twelve Steps and Twelve Traditions, which I suppose is a bit like having a creed. The other noteworthy difference is that the Quakers, like the Samaritans – the ones in Palestine, not the ones on the end of the phone – and the Parsis, don’t normally convert you, so their numbers remain on the whole small (outside Kenya – do they have different rules? ), while converting or ‘twelve-stepping’ a still suffering alcoholic is in theory an integral part of AA practice. Many years later, the state of the world so appals me that what kind of a mathematician I am, or am known as, worries me no more. And – although the Kenyan Quakers probably sing in a different style or variety of styles – here’s a Swahili song of praise from a meeting at Lehigh. I’ve been away for some time, and the fact that I’ve fallen on my back and cracked a rib didn’t help (the crack was misdiagnosed as a bruise by a hospital near me which I’ll refrain from naming). I’m still in some pain (thanks for asking); but I’ve been jolted into sharing my thoughts with you by two developments. My words have run out to describe the atrocities committed against survivors of war and repression. The terror they fled has been added to in an unforgivable cruelty enacted by European governments and all those that stand by in silence. How many more suicide attempts will we witness? How many more fascist attacks? How many more will be locked up with no trial, no translator and quietly deported to prisons that hold no trace of human rights, let alone humanity? How many more will cry out in the night from hopelessness and dreams of the past? How many more will become sick from the awful food they are provided? How many more children will we watch fall from rubber dinghies into the seas? It’s not the ‘end’ of those fleeing their lands but the end of hope of a future in Europe. As the NGO’s presence is cut, along with the volunteers, the witnesses are shut out and Europe will be free to detain and deport them en masse’. Thousands of refugees in Greece are at risk of losing vital support as charities prepare to withdraw services from camps on the country’s “hotspot” islands, as changes to EU funding are set to leave them out of contract by the end of July. The Greek government will take over funding and managing support services to the camps on 31 July, but aid organisations fear the prospect of a “humanitarian gap” resulting from a poorly planned transition. Non-governmental organisations (NGOs) on the islands have received millions of euros from ECHO, the European Commission’s humanitarian division, to provide services from laundry and clothing distribution to maritime rescue and child protection. A spokesperson for the United Nations High Commissioner for Refugees (UNHCR) said the situation is part of the process of “moving from emergency response to a sustainable system”. But the manner in which the proposed handover has been communicated has raised alarm, with some NGOs and local authorities relying on hearsay and rumours while others have received official instruction. 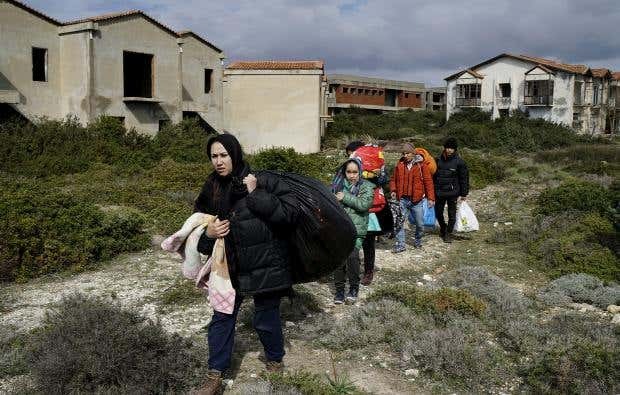 Greek Migration Minister Yiannis Mouzalas recently described the current situation on the island as reaching breaking point, after a spate of problems including suicide attempts amongst the refugee population and violent attacks by far-right groups. The Norwegian Refugee Council (NRC) currently runs two restaurants serving eight hundred meals three times a day to refugees on Chios. Director of NRC’s Greek programme Gianmaria Pinto confirmed that the NGO would cease its operations there on the cut-off date, but that it would be prepared to resume services quickly if asked to. On Chios island, two members of the municipal government confirmed this week that they had received no official communication from Athens regarding the change. Médecins du Monde (MDM) provide medical services on the island of Lesvos, which is home to over 4,000 refugees, according to UNHCR. Their operations in Moria, the island’s state-run refugee camp, will stop at the end of May. Kanakis said a team from the organisation would remain on the island to report on conditions and potential human rights violations within the camp, and expressed concern that vulnerable adults and children within the camp may fall through the cracks during the handover process. “It’s not an established team that will move from another place to there,” he said. “I have a lot of reasons to believe they won’t find all the staff that they need. But hopefully they will do it. We are waiting to see. Pinto agreed that in terms of “ownership and long-term sustainability”, it was important to eventually return management of the islands to the national authorities. who has a ‘well-founded fear of persecution’ on the grounds of race, religion, politics, or membership of a particular social group is a refugee and you can’t send them back (‘refoulement’). What you then do with them is a different mare’s nest, involving asylum and where you got fingerprinted and Dublin III and things I didn’t learn in law school. But monkeying with universally agreed international conventions is a different order of magnitude, whose idiocy is characteristic of Theresa May – who seems not to know that this country signed up to the European Convention on Human Rights in 1953, before she was born, and that it has nothing to do with the EU. I’d remind you (under the heading of poetry) that Odysseus visited a number of Greek islands (Calypso, Circe, Nausicaa, Cyclops) as well as coming from one himself and being in some sense (in most senses) a refugee. If I have time I’ll post a bit of his wanderings which might throw some light on the situation. In the meanwhile here is a lachrymose number from Nawal al Zoghby in which the lady gets so upset she throws her phone on the floor. It may comfort you if you have a cracked rib. You are currently viewing the archives for May, 2017 at Luke Hodgkin.